J Paul Getty Museum located 4 miles from Hotel. Rodeo Drive in Beverly Hills located 3 miles from Hotel. Santa Monica Pier located 6 miles from Hotel. Santa Monica Beaches located 6 miles from Hotel. Third Street Promenade in Santa Monica located 6 miles from Hotel. 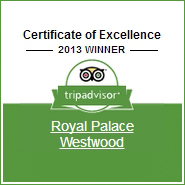 Enjoy free breakfast daily at the Royal Palace Westwood. Located just 2 blocks from University of California and UCLA Medical Center. Save big on your next visit to Los Angeles - check out our special offers & promotions. Enjoy complimentary wireless internet access in all guest rooms plus much more! When visiting the greater Los Angeles area whether you are on an overnight business trip or have a week to spend enjoying the sights of Southern California, you'll find the Royal Palace Westwood a perfect home base. As a guest of the Royal Palace Westwood Hotel you will awaken each morning to our complimentary continental breakfast. 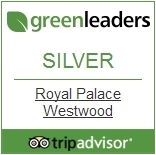 The Royal Palace Westwood, comfortable and convenient. Our location is easy to find and convenient for exploring Los Angeles. Whether you like shopping, museums, art galleries, theatre or restaurants you can find all within walking distance. We are close to all Southern California attractions by quick freeway access. Your evening could consist of a leisurely stroll for dinner and later a movie, theatre or jazz. Our hotel accommodations consist of large rooms, some with patios or balconies. In our guest rooms and suites, there are amenities which business and vacation travelers expect of a first class hotel including queen or king beds with pillowtop mattresses and over 50 cable channels all in High Definition with flat panel televisions. "This small hotel is in a wonderful location--very close to UCLA for a college tour. You can have a continental breakfast before stepping out for the day. Three marvelous things my family and I enjoyed: Comfortable beds..."